Tucked away in the beautiful southern part of the island atop the most gorgeous hill Kalestesia Suites is straight out of a dream. I had been dreaming of Santorini for over 15 years and Kalestesia was where we ended up booking our honeymoon. I was ecstatic with the service—Harry takes such great care of his guest! Giving us suggestions where to eat, what to see, getting us transportation, and making sure we had the best possible time. The Chef there takes great pride in his work and his food is fantastic! He’s so wonderful to talk to as well. The facilities are beautiful, the property is well maintained, they even send you off with breakfast the day you leave if your flight is before regular breakfast hours. This team goes above and beyond to ensure you have the absolute best time in Santorini and I am so glad we stayed at this wonderful place. Where to start? The hotel is located in the village of Akrotiri in the south of the island, which is somewhat less popular with tourists than Thira or Oia. What this means is that you will be staying in a beautiful hotel located in a quiet village, with the most stunning view of caldeira out your room. The room itself is more of a Cyclades-style white house, which adds to the authenticity of the experience. The fantastic Charis (hotel manager) was there for every question/request that we had: he helped us rent our car, gave us dozens of suggestions for places to visit, and recommended the best restaurant we went to on the island. 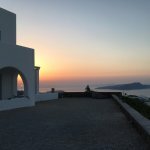 Kalestesia Suites (and Santorini) were hands down the highlight of our stay in the Cyclades.